My Weekend at Scrapbook Cottage! Well, it finally happened! After many years, I actually was able to go away and crop for a few days! And I sure have missed it! A good friend of mine, just opened a Crop House call the Scrapbook Cottage. It is in Hedgesville, West Virginia. About 20 minutes from Martinsburg. The place is absolutely gorgeous!! As soon as I got there, I was relaxed. She has 2 big crop rooms. We each got a 6 foot table to scrap on (those who know me know I tend to spread, so this was good LOL) with your own Ottlight and Craft mat. The food was awesome. Leigh is a great cook. I scrapped until 4am Saturday morning. I just could not stop. The creative juices were going. I scrapped 8 pages in less than 24 hours. I have never done that! Everyone had such a great time. We plan on doing this every 6 months. So, if you get a chance, you should really check it out. You will not be disappointed in the Scrapbook Cottage. Leigh thank you so much for inviting me! I had so much fun! Hey Dawn, I am thinking if my scrapbook room is not done by Spring, that we should go here. We will invite our friends to come with us. what do you think? Ok, gotta run. Going to a Christmas Craft Fair with the kids today. Hubby is staying home to work on the scrapbook rooom for me... YAY!!! I know some of you are still a little surprised that I am on the Creative Memories Design Team. I am not. I am proud to be a part of this team. There is so much talent and the women are so wonderful to work with! You should really take another look at CM. They still have the High Quality albums and tools that we cannot live without, but the things they have and will be coming out with will blow your mind. It sure did that to me. I am honored to be a part of this! So, with that said I want to show you an Advent Calendar I created using CM's Everyday Display, Jewel and Primary Christmas lines and new alphabet stickers. I created this for our 30 Days of Holidays. Each day during the month of November, you will find a brand new holiday project idea that was created with Creative Memories Products by our Design Team. You should really check it out. The squares are 2x2 and I put magnets on the back of each square. I also cut out24 red "X"s and put magnets on them as well to mark off the days as they go by. The stockings and mittens are from Big Lots. I put all the red "X"s in the mitten and the stockings will hold the daily goodies for the kids. I really love the way it turned out and it was a lot of fun to put together. I had the best time ever! We met up with some old friends and camped for 6 days. We hung out and even spent some time with some of Denny's, Kyle's and Tony's Pit Crew one night. yeah we did! Race Day was H-O-T! Hot! I was baking in the sun. But it was all worth it. And even though the end of the race ended in a call from Nascar. Tony won! And I was there to see it! Woo hoo! 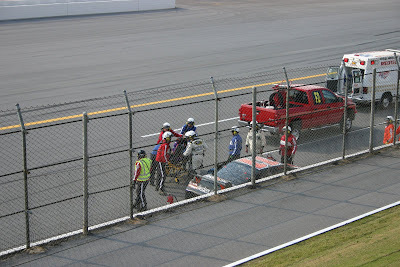 Also, Denny Hamlin was in a bad wreck. 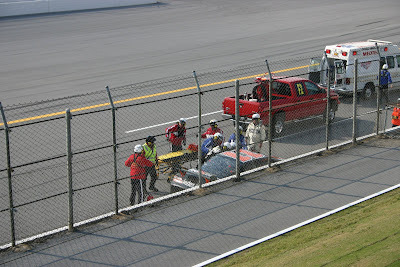 It happened right in front of us on the backstretch. It was bad. He had to be transported to the hospital. But he was ok. The only bad thing about the entire experience was that I was unable to see my friend Gretchen. We talked on the phone, but we were not able to hook up. What were we thinking? LOL The track is huge. She was on the front stretch. I was on the back. I am so sorry Gretchen! I miss you and I wish we could have spent time together. Overall, Talladega was amazing! I had so much fun, but was ready to come home to my family. Next year, we are taking the twins to Richmond to see their first race. I think that may be the only race we make it to next season. But I know the kids will love it! And Richmond is a track we have never gone to before. Fun! Fun! Fun! On a sad note, yesterday was Tony's last ride in the Home Depot #20 car. He starts his new ride with Stewart-Haas next year in the Old Spice #14 car. And it is Red! Yuck! I do not look good in red. I will miss the orange! But we will be ready! We go where our driver goes! So, that is it. 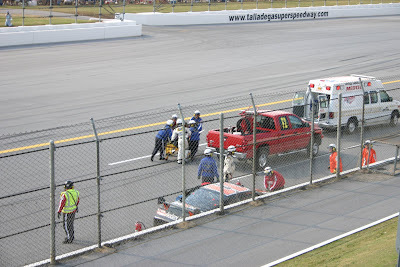 Talladega in a nutshell. I camped. I drank a little too much (shhh do not tell anyone). Spent time with old friends. Met some new ones. Talladega Perfection. 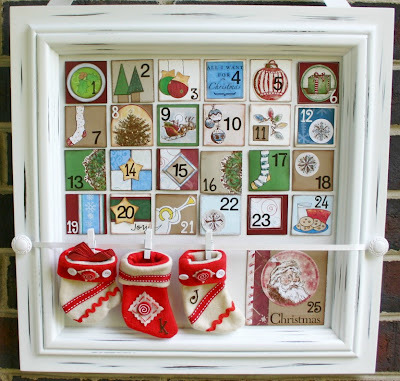 PS I will post an advent calendar I did for Creative Memories in tomorrow's post! I know I have been MIA!! My friend Colleen Stearns told me about a contest A Cowboy's Wife is hosting. let me know if you win..